In 1936, Cunard White Star Line Limited’s chairman Sir Percy Bates was granted an audience with King George V to inquire about a sensitive matter, to get the king’s consent to name one of company’s ocean liner vessels under construction at the time after the king’s grandmother, Queen Victoria. Traditionally Cunard’s vessels had names ending in –ia, and at the time, the Cunard line was on the quest for a more nationalistic and majestic, shall we say, line of vessel naming. Ships have been huge undertakings from time immemorial in terms of physical dimensions and financial commitment, often disappearing on the horizon not to be seen or heard from again, if ever on occasion, until several months later, whether the purpose of their voyage was military or commercial. While the shape of their hulls was determined by the progress of the science of naval architecture at the time, anthropomorphic markings (such as the ‘oculus’) or artifacts (such as figureheads on the prow) were to impose fear on the enemy, dispel bad luck or bring good luck, calm the elements of nature, and so on, and so forth. The naming of ships has often played a similar role through history, and has imparted practical and commercial concerns through the times. There is no formal procedure or nomenclature on vessel naming, but usually after the launching of the vessel on the slipway in the shipbuilder’s yard and the smashing of a champagne bottle on the bow by the vessel’s godmother (again, a superstitious act offering libation to the gods of the sea for favorable treatment of the vessel while plowing the waters), there is the naming (or christening) ceremony at which ceremony the vessel is named and her name is ceremoniously revealed from under garlands and banners; sometimes, the naming ceremony takes place just before the delivery of the vessel to her new owners. And today, by IMO regulations, it is required that the name of the vessel is clearly printed on both the portside and starboard bow and the superstructure, while the name along with her IMO number and her homeport are clearly printed on the stern with lettering at least four inches in height. According to the US Coast Guard, “a name for the vessel composed of letters of the Latin alphabet or Arabic or Roman numerals and may not exceed 33 characters. The name may not be identical, actually or phonetically, to any word or words used to solicit assistance at sea; may not contain or be phonetically identical to obscene, indecent, or profane language, or to racial or ethnic epithets.” On occasion vessels can have two names, one stated on the bareboat charter party and another actually printed on the hull – often trying to accommodate legal or financial considerations. Vessels upon their sale most often change name and the chimney is painted with the house colors and house flag of the new buyer, while the vessel on documents can be identified by the prefix ‘ex-‘ on her previous names, such as MT “Mediterranean”, ex-Exxon Valdez. 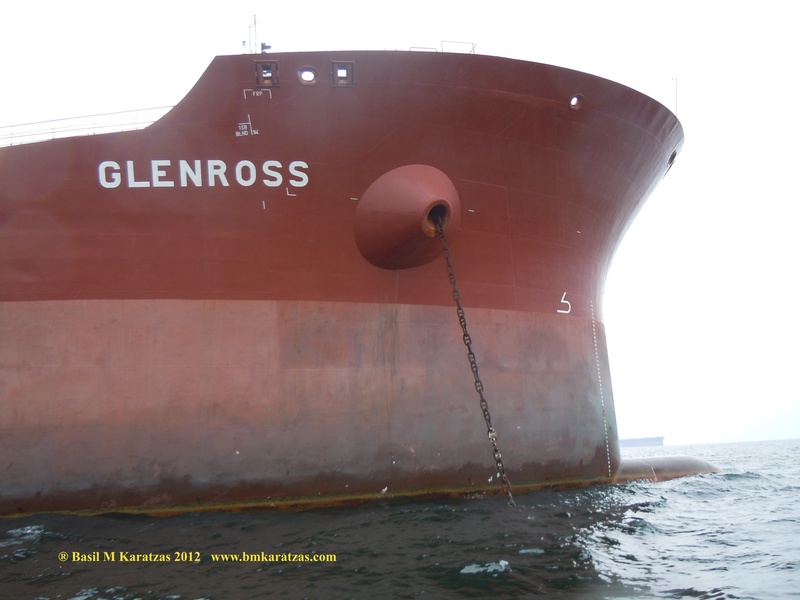 Sometimes, for older vessels or vessels intended for demolition, the new name can be a variation of the previous name, especially if buyers are to save on new lettering and documentation expenses; as such, a once beautiful tanker named MT “Glenross” became just MT “Ross” on her way to the scrap yard by just painting over partially over previous name; no much romance and aspiration in the naming, just surplus black paint (or primer) did the trick. In terms of ship naming conventions and writing style, a ship’s name is always italicized. Prefixes, hull or pennant numbers, and disambiguation are rendered in normal upright font. The definite article is not used with vessel names, and usually feminine pronouns (sometimes neutral as well) are utilized for ships. Common prefixes are MV (for Motor Vessel), MS (for Motor Ship), MT (Motor Tanker), SY (for Sailing Yacht) or MY (for Motor Yacht), while prefixes from older times were SS (for Steam Ship) and RMS (for Royal Mail Ship) or ever older HMS (for His/Her Majesty’s Ship). For a more thorough list of maritime abbreviations, please click here. While the presence of women onboard ships bored on the superstition of bad luck, non military vessels traditionally have been given female (or neutral) names rather than male names. On occasion vessels were named after the shipowner’s wife, daughter or even paramour, mistress or female companion. There have been owners who went as far to name vessels after colloquial names of ‘working girls’ in port cities such as ‘Lulu’, ‘Fifi’, and ‘Zuzu’; vessels trading in the spot market (often called ‘tramp trade’ since the next cargo and voyage is unpredictable and completely dependent on what cargos and trades will be found at the next port call), just as a ‘working girl’s’ schedule in a port depends, well … depends on trade. 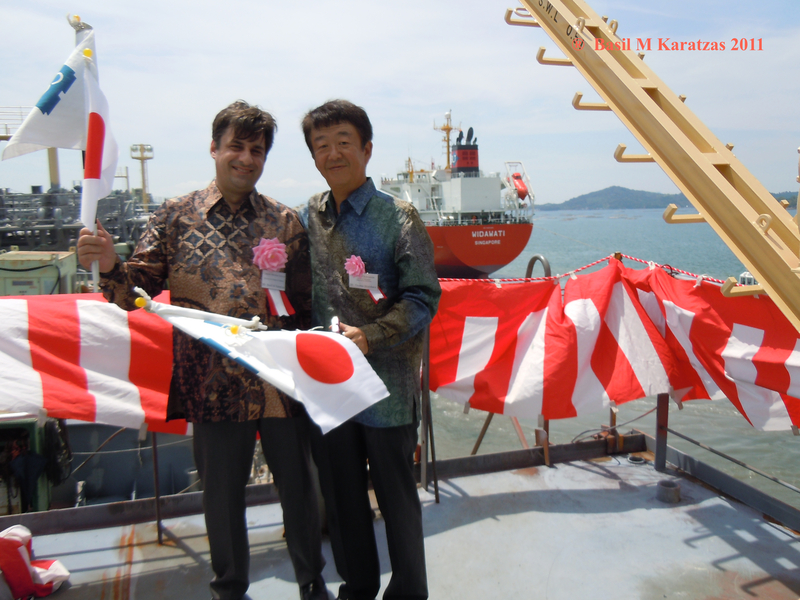 Vessels are named after flowers, whether national (“Chrysanthemum” or not, such as “Rose”), in English or in local languages (“Bunga Begonia” in Malay and Indonesian for “begonia flower’). Vessels are named after “Love” or “Amor” or “Prem” (love in Hindi), while there are trading tankers at present named “Lovely Lady” and “Amoureux” (in love), while we should not forget a sitcom of the past taken place on cruiseship MS “Pacific Princess” (better known as “Love Boat”). Pleasure boats and yachts often bear more affectionate, inspirational or evocative names such as SY “Sea Joy” or MY “Eclipse” (Abramovich’es yacht) or “Octopus” (Paul Allen’s, Microsoft co-founder) or MY “Rising Sun” (Oracle’s Larry Ellison yacht) or SY “Maltese Falcon”. Cruiseships often had alluring names such as “Oasis of the Seas” but now at the age of size and industrial scales are also named MS “Carnival Victory” and MS “Carnival Valor” just the way major industrial shipowners name their vessels with in two-words, with their funnel name accompanied by a second name such as MV “Maersk Alabama” or MV “MOL Japan” or MT “Front Cecilie”. On occasion, ships are pointedly named, especially in times of war and conflict, while veins of nationalism can sometimes run through ship onomatopoeia as well. Japanese-owned vessels often contain the word ‘Maru’ as the last word in a vessel’s name, meaning ‘circle’ literally, but based on the notion that ships are floating castles, protected spaces or small worlds on their own; a rather astute connotation, actually! When the US claimed as prize of war the German-built Vaterland (‘Fatherland’), President Woodrow Wilson had her re-named Leviathan; when asked about the name, his reply was: “Why, that’s easy, Leviathan …It’s in the Bible, monster of the deep.”  In 1952, the ocean liner vessel SS United States was built in Newport News shipyard; the vessel was an engineering marvel of her time in terms of safety, speed, efficiency and luxury, and she was so named to make a point against traditional British dominance of the seas through superior naval architecture and navigational skill. Sometimes shipowners used to recycle names of glorious, lucky or profitable ships, or maintain a line of naming through family generations; during World War II, the dry bulk vessel “North King” survived seventeen crossings in convoys of the Atlantic Ocean and the Nazi U-boats, and even today the multi-generational house of A.G. Pappadakis & Co. has been naming vessels bearing the first name “North” such as “North Prince”, “North Empress”, “North Princess” . In previous and more innocent times when communications were expensive and access to information not instant (anyone remembers such times? ), ship names were more important for trading purposes as charterers and brokers who recalled their names were more inclined to contact the owners for more business. In an interview several years ago in a shipping trade publication, Japanese shipowner Hachiro Kaifu, who was heading Far East Shipping & Trading, brought up such point as “charterers and brokers involved in shipping with Far East often remember our vessels because of their names, and consequently whenever they have a cargo we want, they recall our vessels more quickly than any other vessel,” and thus the unusually but memorably named fleet: MV “Never on Sunday”, MV “Louisiana Mama”, MV “Amor Amor”, MV “El Condor Pasa” and MV “ Shenandoah”. Famous names of ships are Syracusia, allegedly the largest commercial ship in (western) antiquity; Argo, Jason’s ship going after the Golden Fleece, Santa Maria (or fully La Santa María de la Inmaculada Concepción) as Columbus’ flagship on his first trip to Americas; Mayflower bringing the Pilgrims to the western world; HMS Beagle, Darwin’s ship for his scientific travels and call to the Galapagos Islands; Calypso, Jacques Cousteau’s oceanography vessel; HMS Victory, Nelson’s man-of-war flagship. The clipper vessel Cutty Sark (‘short house skirt’) was famous for her sleek lines and fast times and iconic USS Constitution (‘Old Iron Sides’) in the US instrumental in the country’s war for independence; SS Patrick Henry, was the first of about 2,200 ‘liberty ships’ built during the war effort in WWII; Glückauf was the first oil tanker, with MT Exxon Valdez being a tanker of notoriety, and MT “Seawise Giant” (renamed “Happy Giant”, renamed “Jahre Viking”, renamed “Knock Navis”), was the largest tanker (and movable structure) ever built; as the litany of her names suggests, her size was not commensurate with luck or commercial success. But if there is a vessel that rightfully holds the dubious crown of bad luck, and according to polls has been the most recognizable ship name ever, it is RMS “Titanic” that sank on her maiden voyage with great loss of life, some say as the result of a provocative name and claims of man taming nature and delivering the ‘unsinkable’ ship. The Cunard Story; Johnson, Howard; Whittest Books, 1987. Home is the Sailor; Hartley, Herbert; Vulcan Press, 1955. Ἑλληνες εφοπλιστε᾽ς και ναυτιλιακε᾽ς επιχειρἠσεις; Για᾽ννης Θεοτοκα᾽ς & Τζελι᾽να Χαρλαυ᾽τη; Εκδο᾽σεις Αλεχα᾽νδρεια, 2007. This entry was posted in Maritime History and tagged Basil Karatzas, Basil M Karatzas, Karatzas Marine Advisors & Co., maritime history, maritime tradition on April 24, 2014 by Karatzas Marine Advisors & Co..
She was built as an unsinkable ship, a claim allegedly attributed to Bruce Ismay, the managing partner of the White Star Line, the direct shipowning company of the famous RMS Titanic. The year was 1912, and liner companies were in fierce competition with each other for the Transatlantic passenger trade. Fate would not be kind to Ismay and RMS Titanic as both soon floundered spectacularly, both literally and metaphorically. 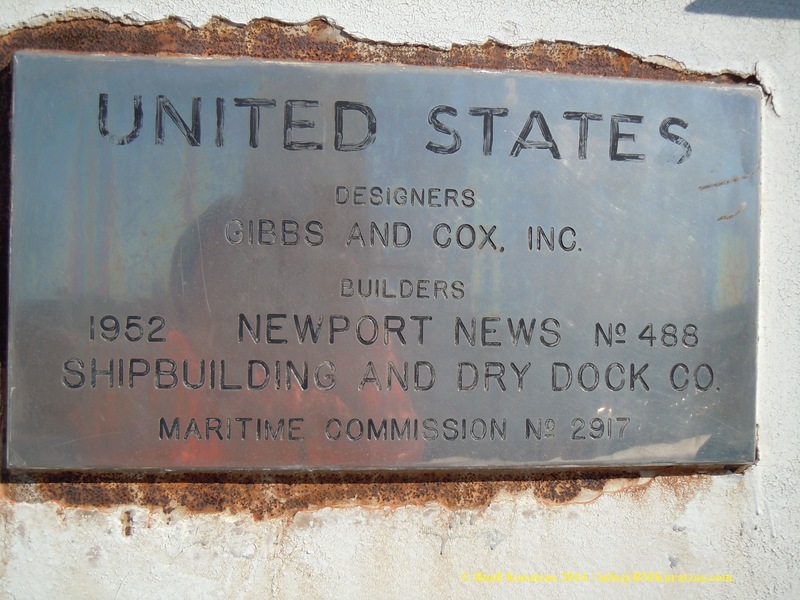 Four decades later, a longer, beamier, stronger, more powerful passenger vessel would be built in the US at the Newport News Shipbuilding and Drydock Company in Virginia for the same trade. Like RMS Titanic, her maiden voyage made great news as well at the time as she crossed eastbound the Atlantic Ocean in record time of about three days and eleven hours. Soon thereafter, she pulverized the record for the more challenging westbound leg of the Transatlantic trip with a record of about three days and twelve hours. She earned the Blue Riband, the trophy for the fastest average cruising speed on both directions of the round Transatlantic voyage, a record that she still holds today, six decades later. Now, an arthritic, gracious, old lady past her prime and with the memory token of the trophy misplaced somewhere in the attic that today’s grandchildren of history would barely care getting bothered about. 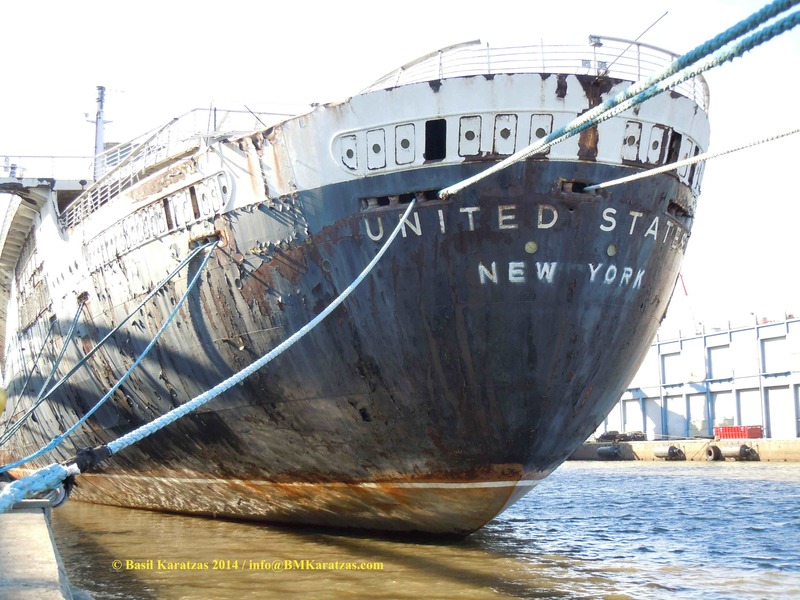 The name of the distinguished old lady is SS United States and her figurative attic is Pier 82 on the Delaware River in Philadelphia. Her speed may have placed her name on the record books, but she has been a remarkable ship in more ways than one. With 990 ft length overall, she was 110 ft longer than RMS Titanic and well within comparison to the 1,000-ft length commanded by today’s supertankers and monster containerships. Despite her length, her beam was kept narrow at 101 ft so that she could pass gracefully through the Panama Canal if her voyage called for it. Her steam turbines were capable of producing 248,000 shaft horsepower (SHP) – more than twice the power of today’s either typical supertanker or a two-engined Boeing 777 airplane. She brought the Blue Riband to American shores from Queen Mary by sailing as fast as almost 36 knots (approximately41 mph), which is believed to be even today the fastest crossing of the Atlantic Ocean in both directions by a standard mono-hull, merchant vessel. Last decade, when the world economies were growing robustly and just in time inventory was in vogue, containerships – the fastest commercial vessels these days – were crossing the oceans at twenty-four knots maximum speed, while in today’s anemic economic environment and high bunkering fuel cost, the fastest containeships typically slow steam at sixteen knots. Cruiseships are capable of achieving close to thirty knots, but usually barely sail above twenty knots in order to economize on fuel expense. 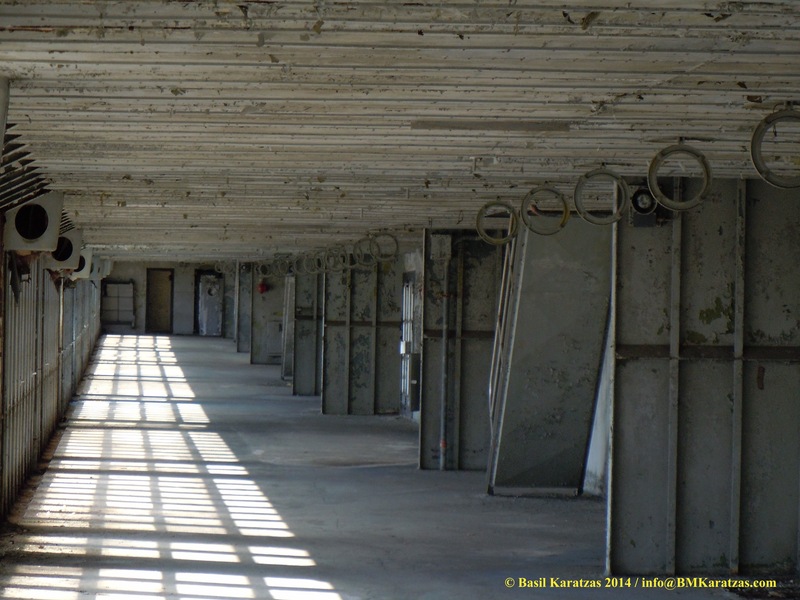 Being built after RMS Titanic’s tragedy, the International Convention for Safety of Life at Sea (SOLAS) in 1914, and after her sistership SS Olympia, SS United States was an embodiment to prevention and safety in the event of unforeseen events. Pioneering luxury: swimming pool onboard with layer of beach sand all around! Two 65-ft tall, brilliantly red-painted funnels with small wings and gently leaning backwards, with a white stripe on top in parallel to a white stripe along the upper end of a black-painted hull, and almost a vertically raked bow and round ‘spoon shaped’ stern typical for ocean liners of that age, SS United States was cutting a graceful figure over the water and on the horizon and her New York City port calls have been immortalized on numerous post cards. Even today, the fainted red color of the two funnels is an eye-catcher when one is crossing the bridge approaching Philadelphia and from afar form the Seaport up the Delaware River; almost like two faint, red candle-flames over the horizon, two candle flames of the memory and glory, a prayer that the wind of modern times will not peel off the colorful existence altogether. In her 800 Transatlantic crossings over her seventeen year career ending in 1969 (about one crossing per week), notable politicians and celebrities enjoyed unparalleled luxury in her fast and graceful sliding over the ocean; Marlon Brando, Coco Chanel, Sean Connery, Gary Cooper, Walter Cronkite, Salvador Dali, Walt Disney, Duke Ellington, Judy Garland, Cary Grant, Charlton Heston, Bob Hope, Marilyn Monroe, Prince Rainier and Grace Kelly, Elizabeth Taylor, John Wayne, and the Duke and Duchess of Windsor are known to travelled with her. Four U.S. presidents sailed aboard SS United States overtime, Harry Truman, Dwight Eisenhower, John Kennedy and Bill Clinton, the last as fresh graduate from Georgetown was on his way to study at Oxford as a Rhodes Scholar in 1968, one year before the retirement of the vessel. 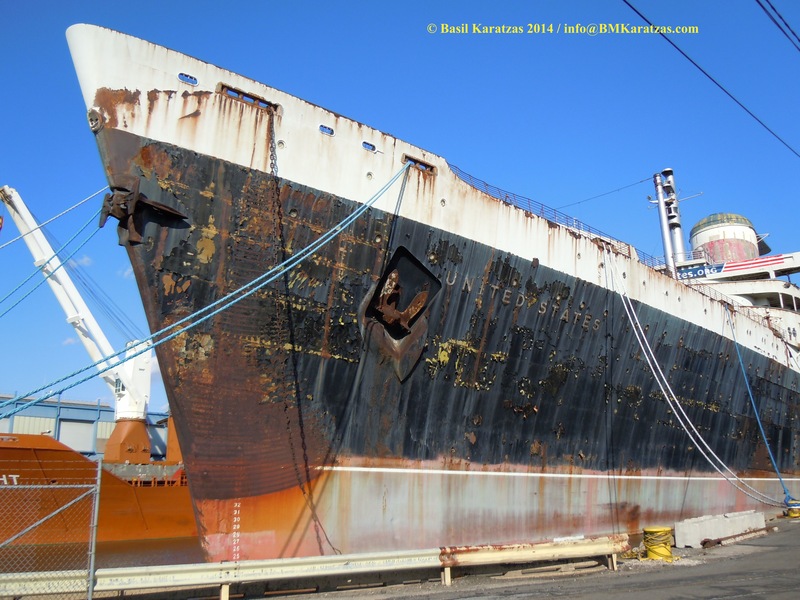 Ever since her retirement from active duty in 1969, the ship has been having a tumultuous life seeking a purpose and a permanent home; she has changed ownership several times since then, with buyers hoping to find commercial uses for her. She was designed as a passenger liner vessel to travel fast and her conversion to a cruiseship or theme vessel or a floating hotel is not absolutely ideal, as she’s too narrow by her beam and her fuel consumption (replacing diesel powered steam turbines) will be high. 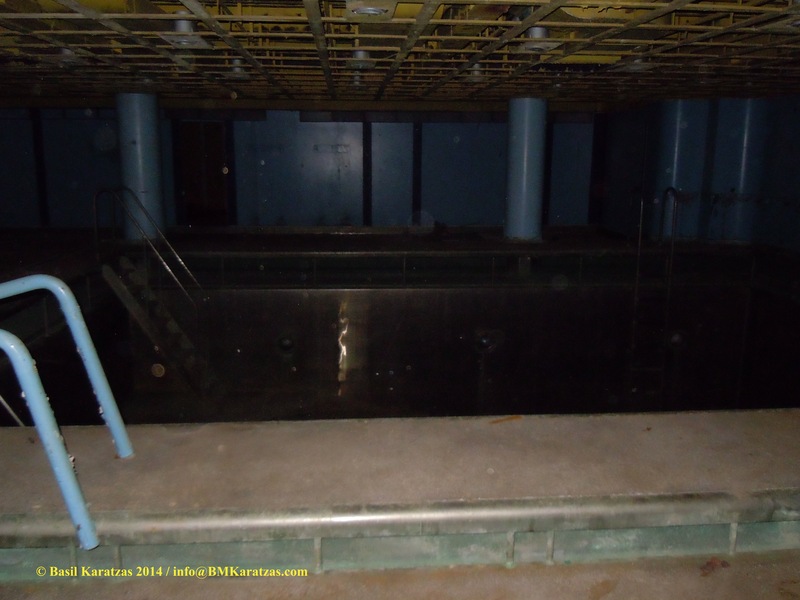 She has been gutted internally and most of the asbestos has been removed, so she’s ready for her next development stage. There have been proposals for her to be developed as a museum or theme vessel and get relocated to major metropolitan areas, possibly New York, perhaps along the historic aircraft carrier Intrepid or find a place with Vision 2020: New York City Comprehensive Waterfront Plan. 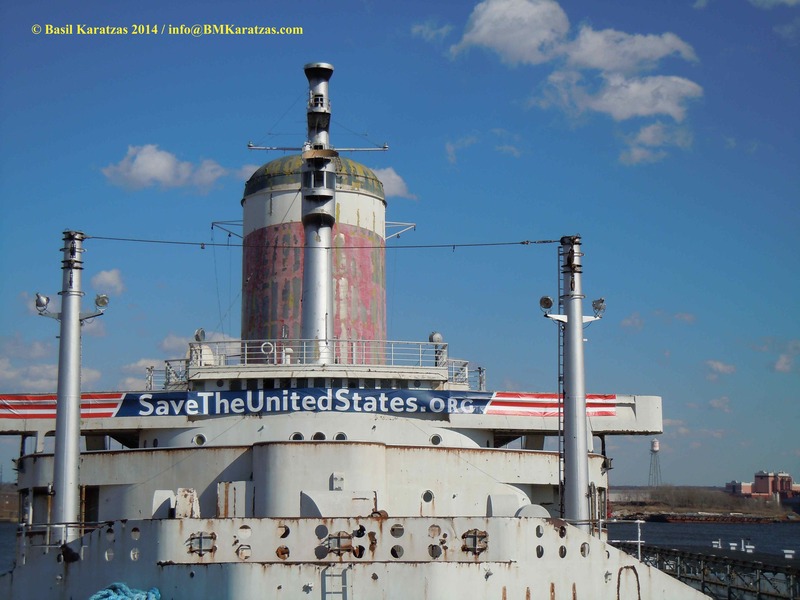 At present, the vessel is owned and controlled by the SS United States Conservancy (http://www.ssusc.org/), an non-for-profit organization, under the leadership of Susan L. Gibbs, the granddaughter of ingenious William Francis Gibbs, the naval architect and marine engineer who designed SS United States (and also notably the vessels that would be known as ‘Liberty Ships’ during WWII.) Through sizeable donations and ongoing fund raising efforts, the Conservancy has kept a close watch over the vessel and her constant need for upkeep and continuous cleaning efforts. However, a couple of recent proposals for the ship’s development have fallen apart, and the running costs of keeping the vessel at her present location is more than $60,000 per month. 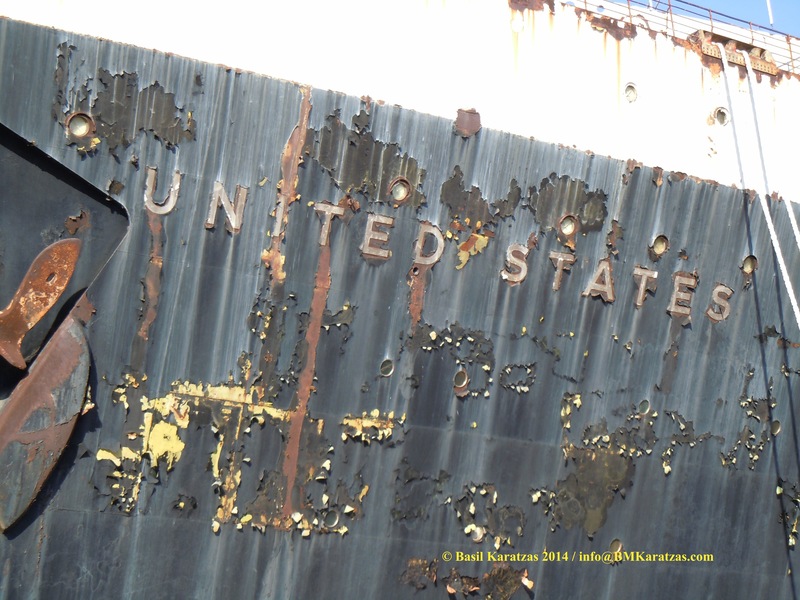 We have had the distinct honor to be invited recently by the SS United States Conservancy to board and tour the vessel, to be allowed to get a glimpse through history’s spider-webbed, broken glass of a porthole into another age and way of life. It was a breezy, sunny day in March after a long winter in Philadelphia and the Northeast; just to envision for a few hours the luxury ship built with military grade steel and aluminum superstructure careening effortlessly fast over the ocean, with Marilyn Monroe lingering on a chaise lounge chair on one of the sundecks portside and Salvador Dali pondering on surrealism by his cabin starboard, John Kennedy leaning over a book in the library while there was a stage performance in the theater abaft, it was indeed a unique invitation to have a front row viewing to a maritime and historical miracle, a project of supreme American engineering and soaring ambition, to a ship that links us to the roots of American maritime tradition which regrettably seems to slip further away from us by the day. While ‘unsinkable’ RMS Titanic got crushed by fate soon in her maiden voyage, SS United States, more than sixty years after she was launched from a navy shipyard, still stands tall, a testament to her shipbuilder’s ambition for building a ship that ‘you cannot catch her, you cannot set her on fire and you cannot sink her’. 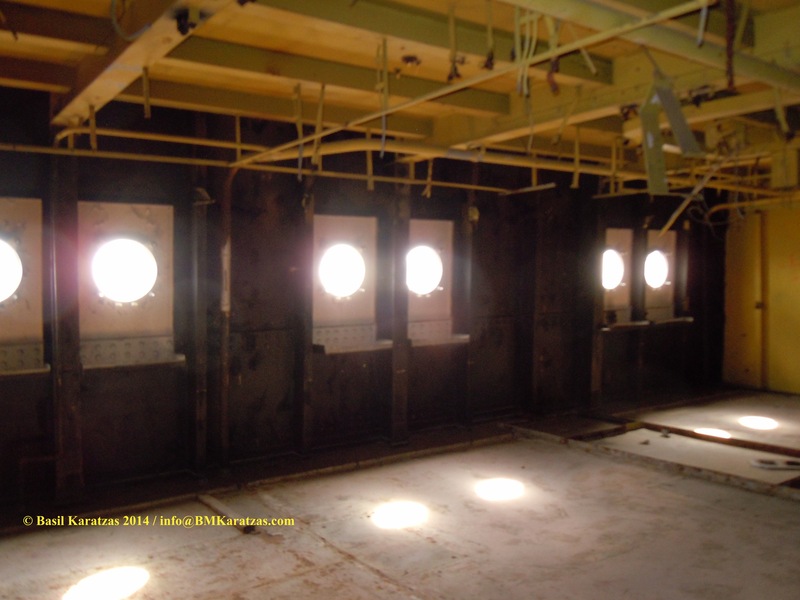 The pictures taken during the recent visit are a testament to her magnificent structure and an invitation and challenge to see the ship restored to her past glory; we owe it to her! 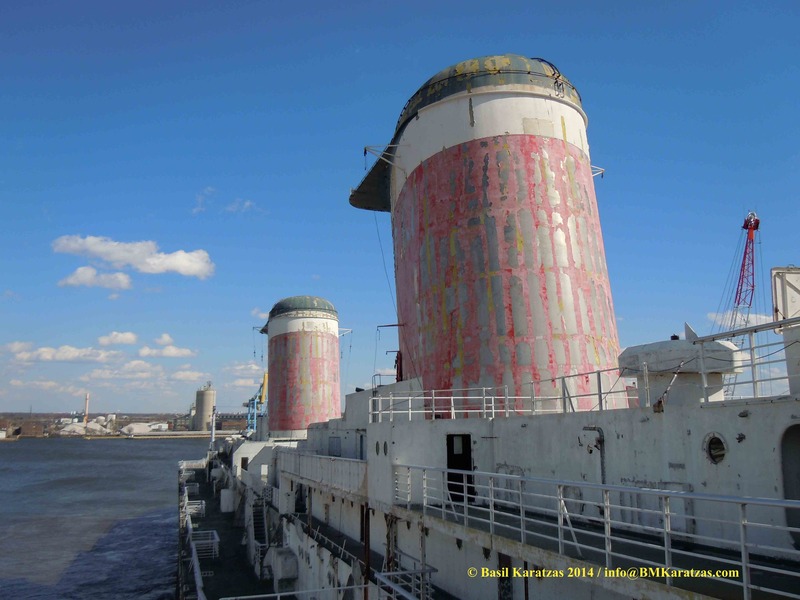 Additional pictures, including many historical pictures collected from the internet, can be found on the Pinterest page of Karatzas Marine Advisors, board for SS United States! 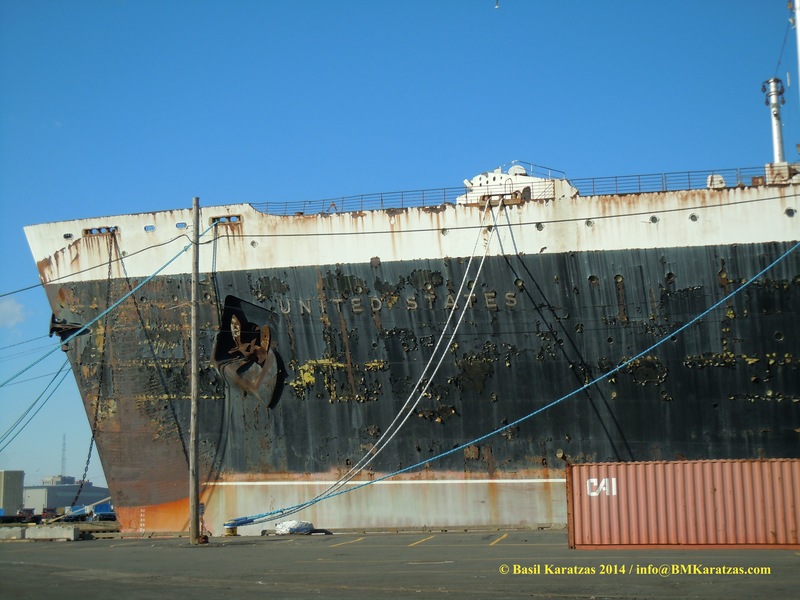 This entry was posted in Maritime History and tagged Basil Karatzas, Basil M Karatzas, conservancy, Karatzas Marine Advisors & Co., ocean liner, SS United States on April 12, 2014 by Karatzas Marine Advisors & Co..